Maximise and brighten blonde, highlighted and grey hair with the Expert Colour Care Platinum Supersize Shampoo from Jo Hansford. Exclusively developed in her Mayfair salon and utilising advanced technologies, the lightweight, sulphate-free formula works to eliminate dirt, oil and impurities while infusing locks with essential moisture and vitamins, with a violet colouring to counteract uneven, brassy and yellow tones. Fortified with the exclusive Colour Care Complex and Anti-Fade formula, it contains Sweet Blue Lupin peptides that have been scientifically proven to prolong hair colour vibrancy and tone for up to 30 washes, while Iselux LQ delivers effective cleansing without dulling colour. Concentrated extract of Sunflower Seed combats free radical damage and enhances hairs natural elasticity, plus the addition of Keratec, a unique keratin-based ingredient, creates a protein shield to smooth the cuticle and limit environmental aggressors. Expect luminous, clarified locks with natural looking, enhanced colour and shine. Apply to wet hair and gently massage into hair and scalp. Rinse thoroughly. Repeat if necessary. 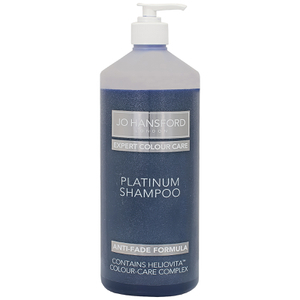 For best results, follow with the Jo Hansford Expert Colour Care Platinum Conditioner. Aqua (Water), Sodium Lauroyl Methyl Isethionate, Cocamidopropyl Betaine, Acrylates/Palmeth-25 Acrylate Copolymer, Benzyl Alcohol, Hydroxypropyl, Guar Hydroxypropyltrimonium Chloride, Sodium Chloride, Phenoxyethanol, Propylene Glycol, Quaternium-80, PEG-150 Pentaerythrityl Tetrastearate, PEG-6 Caprylic/Capric Glycerides, Sodium Hydroxide, Limonene, Butylene Glycol, Xanthan Gum, Parfum (Fragrance), Dehydroacetic Acid, Helianthus Annuus Sunflower) Seed Extract, Hydrolyzed Lupine Seed Extract, Keratin, Hydrolyzed Keratin, Sodium Benzoate, Linalool, Citral, Glucanolactone, CI 60730 (Acid Violet 43).